Once again, Sonoma Concierge, is helping organize a fundraiser for the Bodega Bay Fire District to help buy a new ambulance. Thousands have been raised but not close to the $90,000 that is needed. This event is going to be super fun and you won’t want to miss out! Our last 3 events have caused us to dine on delicious BBQ by Sonoma Concierge’s BBQ Team of Smokin on the Coast. The bands are rock n roll and country, the guests are all ages from children to adults. The Chanslor Red Barn is the perfect venue indoors and outdoors overlooking the ocean with beautiful horses in the background. You can camp at the Ranch too! This next event should not be missed. 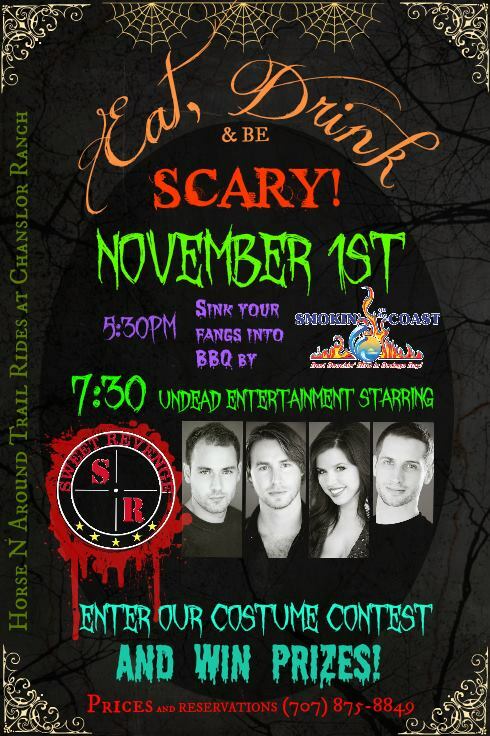 Wear a costume or not but bring your “have fun” attitude and a hearty appetite for BBQ and dancing. The full bar will be hosted once again by the Fire Fighters and all proceeds go to the ambulance fund. Do you really want to be the one who does not attend??????? ?